Check Size: 7 7/8" x 3 1/16"
Go stub-free with this compact version of our manual business checks! You'll get a general disbursement check in a handy book of single checks (instead of 3-per-page). 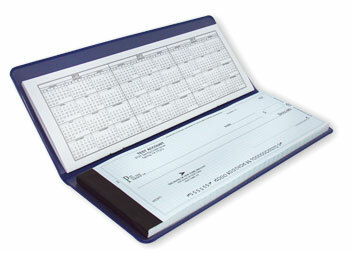 It gives you the convenience of a personal checkbook without compromising on professionalism. Pocket Checks are ideal for small businesses that need to make their checks portable. It's also a nice choice for clubs, organizations and home-based businesses. With this product package, you get a complete set that comes with deposit tickets (16 deposit tickets for every 50 checks), a check register and a navy blue, vinyl checkbook cover. 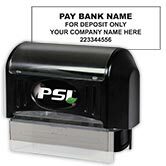 The checks are available in quantities of 50 or 200 and come printed on traditional blue safety paper. Get your Pocket Business Checks Set today and easily take your business checks with you wherever you go!